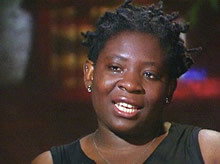 Evelyn is a powerful and inspiring speaker who was brought from her native Cameroon to be a slave in the US. She tells us, "I was inspired to be part of this movement because I was once a child slave myself. My goal is to help inform people all over the world that modern day slavery is still going on around us." Today, Evelyn is a full-time student in the University of Maryland University College majoring in Homeland Security. She has decided to focus her life and work on humanitarian issues. She is strongly passionate about ending human trafficking. "Where I come from, lack of knowledge about human trafficking and human rights is an everyday reality. I am the first woman from my country of Cameroon in West Africa to have been fortunate enough to escape enslavement and gain a university education about human trafficking. I now understand that I am in a unique position to do something about human trafficking in West Africa, in my hometown, and the rest of the world." To book Evelyn as a speaker or to read more about her, go to Evelyn's main page.